UltraCMOS Image Reject Mixer features double-balanced high LO–RF isolation. Operated with single-ended signals on the Radio Frequency (RF) and LO ports, PE41901 Image Reject Mixer can be used as either upconverter or downconverter. Reducing LO leakage by including LO path 90° coupler and RF port baluns on single die, unit improves LO-RF isolation. Manufactured on UltraCMOS process, product is suitable for Ku-band earth terminals like Very Small Aperture Terminal block upconverters, point-to-point microwave links. 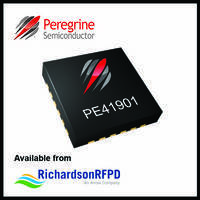 Peregrine’s UltraCMOS technology enables industry’s first high-frequency RF SOI mixer. Richardson RFPD, Inc. announced today the availability and full design support capabilities for a new image reject mixer from Peregrine Semiconductor Corporation. The PE41901 is a passive, double-balanced Ku-band image reject mixer with high dynamic range performance and high local oscillator (LO) isolation capable of operation up to 19 GHz. It can be used as an upconverter or a downconverter. The PE41901 operates with single-ended signals on the radio frequency (RF) and LO ports. The intermediate frequency (IF) port accepts broadband quadrature signals from DC–4 GHz. The device includes two mixers, an LO path 90° coupler and RF port baluns on a single die. Integrating this functionality on a single die reduces LO leakage and improves LO–RF isolation, while minimizing board space and design effort. In addition, no external blocking capacitors are required if 0 VDC is present on the LO or RF pins. The PE41901 image reject mixer is ideal for Ku-band earth terminals such as very small aperture terminal (VSAT) block upconverters, point-to-point microwave links and test and measurement (T&M) applications. The PE41901 is manufactured on Peregrine’s UltraCMOS® process, a patented variation of silicon-on-insulator (SOI) technology on a sapphire substrate, offering the performance of GaAs with the economy and integration of conventional CMOS. To find more information or to purchase this products today online, please visit the PE41901 webpage. The device is also available by calling 1-800-737-6937 (within North America); or please find a local sales engineer (worldwide) at Local Sales Support. To learn about additional products from Peregrine, please visit the Peregrine storefront webpage. Richardson RFPD, an Arrow Electronics company, is a global leader in the RF and wireless communications, power conversion and renewable energy markets. It brings relationships with many of the industry’s top radio frequency and power component suppliers. Whether it’s designing components or engineering complete solutions, Richardson RFPD’s worldwide design centers and technical sales team provide comprehensive support for customers’ go-to-market strategy, from prototype to production. More information is available online at www.richardsonrfpd.com. Audio Software provides real-time digital remastering. Metered Mixing System offers closed-loop flow control. Ultra-Wide Bandwidth RF Mixers offer application flexibility. Frequency Mixers offer L-R isolation up to 55 dB.